Many studies examine the effect of children on parents’ happiness over a lifetime, and some look at the impact of one child, two children or more than two children. As a parent of four kids, I’m often asked a more specific question: Which was a harder transition, having your first or second child? I almost never give advice on whether people should have children, but when it comes to saying having which was more difficult for me, I don’t hesitate. Having my second child was a lot more overwhelming, because suddenly I had no downtime and not enough hands. When my second child napped, my first was awake. When my older son who was learning to ride a tricycle took off toward the street, I had to decide whether to chase after him with a baby in my arms or leave my baby alone in the yard. And so I wondered, which kid is harder on parents’ immediate happiness? Is there data that could help answer the question? Since 1972, the National Opinion Research Center at the University of Chicago has been conducting the General Social Survey, whose aim is to “gather data on contemporary American society.” The nationally representative longitudinal survey asks many of the same questions each year. One question attempts to measure people’s happiness: “Taken all together, how would you say things are these days, would you say that you are very happy, pretty happy, or not too happy?” The survey includes similar questions on how satisfied the respondent is with his or her marriage or cohabiting relationship, and financial situation. Exploring this data, I tried to measure how people’s happiness changes in the year or two after they have their first or second child. To be clear, I’m not saying these numbers can prove the causal effects on happiness of having a first or second child, but they can add insight and lend themselves to deeper exploration. 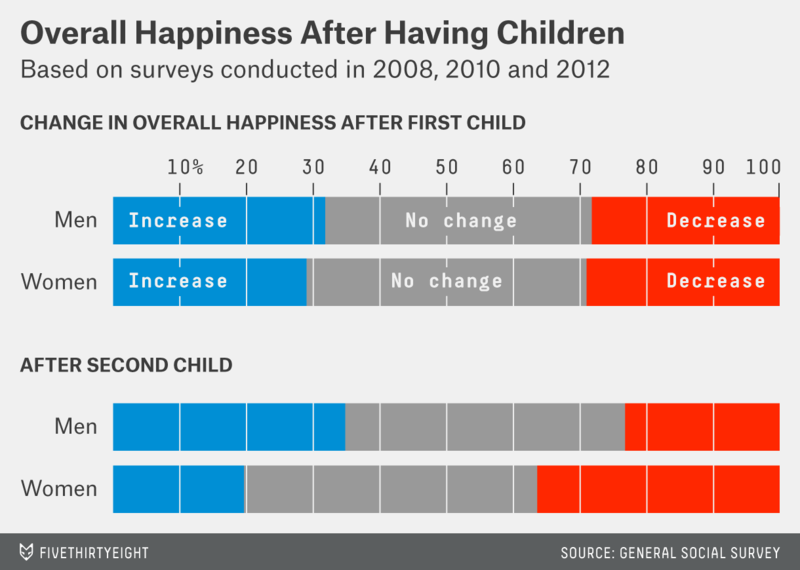 Here’s what I found: When it comes to overall happiness, the short-term impact of the first child is about the same for men and women. Sixty percent of parents experience a significant change in happiness in the year or two after their first child is born.2 Of the 60 percent, half are likely to be happier, and other half are likely to be less happy. How do first and second children affect men’s and women’s satisfaction with their marital or cohabiting relationship? 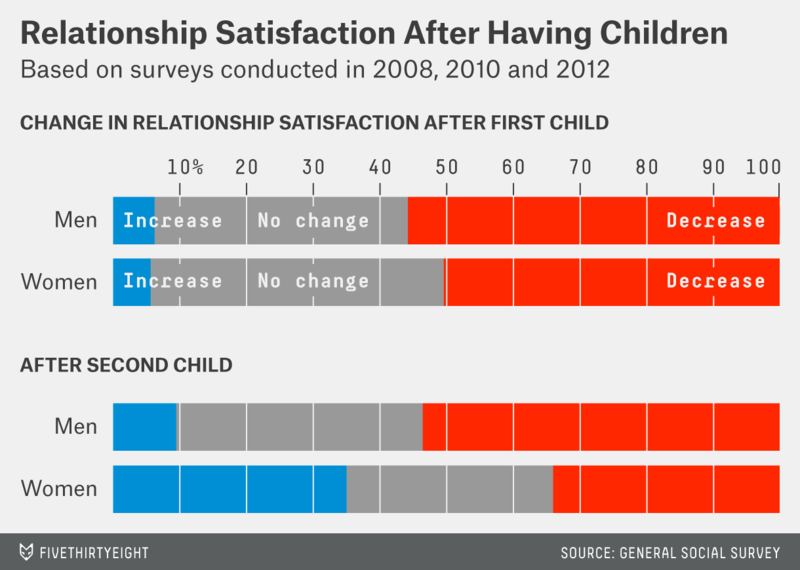 Sixty-two percent of men and 56 percent of women experience significant changes in their relationship satisfaction after the birth of a first child. Of those experiencing a change, 90 percent of men and women are less satisfied in their relationships. It’s important to remember that these lowered levels of satisfaction are for the first year or two after the child’s birth. Let’s turn to men’s and women’s view of their financial situation. As estimated by the U.S. Department of Agriculture (USDA), a middle-income family in the U.S. can expect to spend $241,080 to raise a child born in 2012. (That figure only includes costs up to the child’s 17th birthday and doesn’t include college expenses.) For children born into high-income households, the estimated cost was $399,780. It’s much harder to estimate the costs of a first vs. a second child, as well as the relative effects of each. The USDA estimates that a two-parent household with one kid spends about 27 percent of its income on that child, and a two-parent household with two kids spends 41 percent of its income on the children. It makes intuitive sense why a family would spend more on the first child. Families have to buy baby supplies for the first time and change the way they earn income, such as taking parental leave or switching to part-time work or self-employment, and possibly paying for day care. For a second child, much of the baby equipment can be reused. Day care is sometimes offered at a reduced rate for a second child, and the cost of a hotel room for two adults and two kids during family vacations is usually the same as a hotel room for two adults and one kid. FiveThirtyEight contributor Emily Oster has done some calculations on the impact of spacing a family’s first and second child and finds that in certain situations, it may be economically preferable to have two children closer in age. However the dollar and cents of childrearing play out, the majority of parents — 67 percent of men and 52 percent of women — experience a significant shift in satisfaction with their financial situation after the birth of a child. Of that subset, 55 percent of men and 65 percent of women are less satisfied with their financial situation after the birth of their first child. 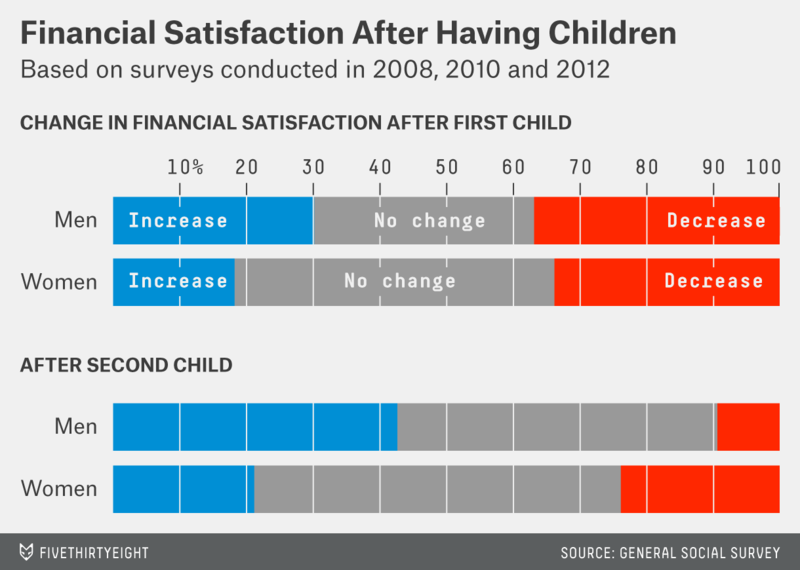 The birth of a second child appears to have less of an impact on men’s and women’s levels of financial satisfaction. But of those parents who experience a change, only 18 percent of men and 53 percent of women are less satisfied financially. In other words, women are much more likely to become dissatisfied with their financial situation. I’ve focused on short-term effects of children on parental happiness, but there is a lot of good research examining the long-term effects. Take this longitudinal study out of Britain, which finds that when you control for socio-demographics of households, children seem to make married people happier over time, and moms even happier than dads. This study finds single people’s level of happiness is not significantly affected by whether or not they have children. In a technique that produces similar levels of robustness to a longitudinal study, researchers used a twins data set from Denmark, comparing twins who as adults had varying number of children. Twins allow researchers to compare what happens to two very similar people in the presence or absence of varying life events. The researchers found that first children appear to have a positive effect on the life satisfaction of mothers and that additional children have a negative effect. As for fathers, the first-born child appears to have a positive effect and additional children have no real effect. But we should be careful when comparing international results. The impact of children on happiness and satisfaction varies across countries. For example, researchers in Italy find that within Europe, the happiness of parents, compared with non-parents, can be greatly affected by the political environment in which they reside. Just because my analysis shows that a second child negatively impacts women’s short-term happiness — and my personal experience attests to that — I am in no way arguing that you should only have one kid. I chose to have a third, and fourth, so clearly the transition wasn’t enough to make me not want to have more children. All I have to do is sit with one of my friends and their babies, and it’s easy to see why we would want to live with one — or two — of these amazing little creatures. Some might wonder whether 2008 was a particularly bad year when it comes to Americans’ happiness because of the financial crisis and recession. I checked to see whether the difference in trends between 2008, 2010 and 2012 was statistically significantly, and they were not. Studies do say the financial crisis affected the answer to the General Social Survey happiness question, but only for a short time. The recession did have an effect on happiness, but it was probably more of a population effect so that all the levels would be affected. If the recession were a driving force behind the change, I would expect to see very different trends following the birth of children in other years. By significant change, I mean a change of at least one point up or down the ordinal happiness scale. Because there are three levels to the “very happy, pretty happy or not too happy” scale, parents can change zero, one or two points in either direction. Because we are not able to account for length of time in the relationship, we looked at the overall change in relationship satisfaction for all parents as a proxy and found that among all parents who experienced a change in relationship satisfaction during the same period, three out of 10 are likely to experience lowered levels of satisfaction in their relationships.